Welcome to the first unprinted edition of the Caspar Newsletter. We decided not to commit a bundle of paper and postage costs to this issue, and are delighted you found us on the web. If you know someone who needs to know about this Newsletter, and internet access isn't easy for them, please share your capabilities. We certainly do not mean to discriminate against folks who aren't web-savvy. Sometimes I wish I weren't! If you have any questions or feedback about this edition, please email it to ed@casparcommons.org. This issue of the Caspar Newsletter focuses on a matter that concerns us all: non-native species and the effect they (and we) have on our natural environment. As always, the Newsletter's intent is to share information, and create a shared understanding so we can work toward a solution together. More than one controversy lurks in this issue, and we hope you'll read on, inform yourselves further as necessary, and then join us for the Community Meeting on May 11th to work together toward a course of action. There is no controversy about invasive exotic species, plants and animals: too often, they bring on ecological disaster. The disagreement centers around how much responsibility each of us bears for the plants and animals we import and abet, and how drastic are the measures we are willing to use to control the nastiest of the invaders left by our forbearers. In this newsletter you find several articles written by strong advocates of dire means, including the authoritative Eucalyptus indictment written by State Parks' expert on managing exotics Peter Warner, who advocates a draconian solution: cutting and then careful application of a dire chemical to eliminate every tree. Your due diligence shouldn't end with this Newsletter. Because this is a difficult issue, I have assembled a page of online resources at the Caspar Village website, CasparCommons.org/Gorse/ to get you started learning more about invasives, habitat restoration, and glyphosate. The answer to this question is simple: invasive species will take possession of the Headlands. 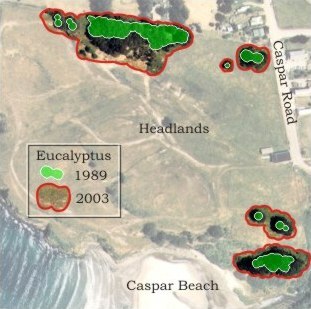 Here's a picture showing the encroachment of Eucalyptus on the Headlands over the last 15 years. Eucalyptus is one of five invasive exotics presently enlarging their hold on the bit of Caspar recently acquired by State Parks. We live on an island of good soil and clement weather, and can grow almost anything we want. Local nurseries happily sell dangerously invasive plants without so much as a warning. If we are serious when we say we want "to preserve and enhance the quality of all life in Caspar," does that care extend to exotic plant species like gorse and Eucalyptus? or does it justify an earnest effort to abate the invaders? Remarkable changes have taken place in the last fifteen or twenty years here in Caspar and all over California. Hardware stores and wine bottles advise us they contain chemicals known to the State of California to cause cancer. Recently, awareness has dawned that in a century and a half of settlement, we human invaders have completely changed our environment's flora, and have greatly affected the fauna, by heedless planting of dangerous, if attractive, plants: Cotoneaster, Scotch Broom and its kin, Himalaya berry, Hollyhock, Purple Lupine ... the list goes on and on. From the earliest historical records, northern California, and particularly the coastal plain, has been described as an amazingly rich and diverse environment. Caspar is part of what Sunset's encyclopedic and indispensable Western Garden Book describes as Zone 17, a narrow, temperate, riotously fertile garden stretching from Point St. George at the Oregon border to Point Conception near Santa Barbara, 600 miles south. We can grow everything from agave to zoysia ...but should we? At this time of year, many visitors ask, "What are all those pretty yellow flowers?" And veteran Casparados take a deep breath and start their lament about our most famous invasive exotic, Gorse (Ulex europaeus). On a nice warm summer day, Gorse shoots its seeds 30 feet from the plant; these robust little bombs can lie dormant for an average of 30 years, until a heedless gardener disturbs the soil, and the whole horrible cycle begins again. On a warm, dry autumn day, a well established stand of gorse -- roots and stems are 30% combustible oil -- can burn like an inferno. Here's what Jerry Juhl wrote about a gorse fire in 1987: "Our real estate agent had warned us that gorse was a pernicious weed, but since we had just found our dream house, all we said was, 'but aren't the yellow flowers pretty!' Now those flowers were on fire, or soon would be. One of our neighbors had a field of gorse, too, and a wall of tangerine flames was advancing through his field toward ours. The air was filled with the cry of sirens and thick, black smoke..."
Gorse may have immigrated to Caspar in the 1930s. in hopes it would limit the spread of gorse. The mites appear to need help. The legend of gorse's arrival in Caspar has several versions, but in every one, gorse escapes from its keepers and takes over acres of previously lovely rangeland and bluff. Some diligent stewards have kept gorse at bay, but they will tell you that the cost of freedom from gorse is constant vigilance! (There's more on this in "The Bradley Method" at Caspar's online Gorse Resources.) Caspar's most extensive stands of gorse belong to California State Parks, and tens of thousands of tax dollars have been spent, and fifty thousand more are ready to be spent this year, trying to control Gorse and other invaders. Eucalytptus is another handsome but nasty species. (For a list of the most offensive plants, click here.) Peter Warner, State Parks' expert in charge of controlling invasive plants, offers his opinion in an article entitled An indictment of Eucalyptus globulus (below). In addition to its flammability and bad plant citizenship -- like gorse, it is allelopathic, meaning it poisons the soil beneath it, making it unsuitable for any growing things other than itself -- these weeds are spectacularly successful at grabbing land. Starting in 1989, when active stewardship on the Headlands stopped, the Eucalyptus have tripled their acreage, rendering it tangled and poisoned. The Eucalyptus stand along the northern border of the Headlands now obscures half of the ocean view from the deck of the Caspar Inn. Help Is Here ...But Do We Want It? Remembering that Eucalyptus and gorse poison the ground they grow on, are we willing to use chemicals against them? Do other techniques work? If you have ideas about gorse, Eucalyptus, Himalaya berry, pampas grass, and other invasives, or if you'd like to participate in the deliberations that will lead to getting these nasties under control, please come to the Community Meeting on May 11th, at 3pm at the Caspar Community Center. Prior to the meeting, rain or shine, starting at 2pm, I will lead a one-hour "Invasives Inspection Tour" onto the Headlands to see how the invaders are taking over. Wear stout shoes, because the Eucalyptus renders the ground dangerous. The Coastal Prairie, the North Coast grasslands between the bluffs and the pine forest, is almost nowhere in its original form: only 800 hectares of high quality native dominated Coastal Prairie remain of the original 350,000 hectares in the 1800s. Along with human occupation and land use the spread of invasive exotic grasses is one of the main causes of the destruction of the Coastal Prairie. These exotics are called 'new natives' because they are impossible to eliminate from the region. They are weeds, and more than in the sense of plants being in the wrong place. They set huge quantities of seed, grow quickly into reproductive adults, and exclude native grasses from germinating and establishing. In a series of experiments at Sea Ranch, Sweet Vernal Grass, one of the main introduced grasses on the North coast, was able to germinate and establish in stands of Tufted Hairgrass, a native bunchgrass, but in the reciprocal introduction of the native into Sweet Vernal Grass, the native did not establish at all. Velvet grass, a major invasive exotic, builds up dead litter that smothers other plants and prevents other species from germinating. In accumulating this biomass the grass probably reduces biological diversity in the Coastal Prairie. In addition, both exotics have persistent seed banks, or reserves of seeds in the soil, that allow seeds to germinate and establish years after adult plants have been cleared from a site. In surveying the 30-acre site of the Caspar Headlands, no native grasses are visible from the distant perspective of Caspar Road. All grasses in view are exotic. A closer look along trails and in low patches, areas where because of trampling or other stresses the introduced grasses do not establish, reveals sparsely distributed individuals of the most common native grass on these Headlands, California Wild Oats. But in general this plant and other natives are now excluded by the exotic grasses with their smothering affect. In my graduate research I attempted to remove the competitive advantage of greater height by clipping at certain times of year as a means to increase California Wild Oats and control Sweet Vernal Grass and Velvet Grass. My work showed that California Wild Oats tends to increase after clipping in the Coastal grasslands. In spite of the rarity of the native dominated Prairie there are local sites to visit that have fairly good examples of it. These are termed "reference sites" in restoration ecology because they give clues to the associations of native plants in nearby sites where restoration is planned. It's important for local residents to visit these and be inspired by their beauty, so they can be a driving force for community driven restoration and land management. One of the best reference sites for Caspar is Jefferson Way, the northern portion of Jughandle State Reserve, where excellent patches of native Coastal Prairie are mixed in with patches of exotics. The low growing Prairie grasses "read" much differently to the eye, with dense tufts of Hairgrass rising out of lawns of California Wild Oats, than the wheat-field like gestalt of the introduced grasses. They provide a setting for and are less likely to competitively exclude the kaleidoscopic galaxy of native wildflowers of the North coast. Introduced and established to California about 150 years ago, Tasmanian bluegum (Eucalyptus globulus) has worn out its welcome for many native residents, and not just the human ones. Despite its initial appeal as a fast-growing source of shade, timber, and fuel, land managers along California's coast now recognize this fast-growing tree imported from down under as both an ecological and economic liability. Bluegum is well-adapted to a Mediterranean climate and granitic-derived soils, and benefits from our cool, foggy summers and the rich alluvial soils of our coastal plains and valleys. However, wherever these tall trees prosper, other species suffer. Even thinking of planting these trees in California's fire-prone climate is tantamount to arson. Few plants in California can match the bluegum track record for mayhem - they make the roughneck apple trees in "The Wizard of Oz" look positively saintly. On at least two occasions in the San Francisco Bay Area over the past 20 or so years, limbs have suddenly fallen from these trees and killed unsuspecting humans - the species has a propensity for branch drop on hot, still summer days. During winter storms, many of these trees have toppled onto homes, cars, and barns, and across roads and utility lines - their shallow root systems and ample foliage render their top-heavy stature just a bit unsteady when the wind howls and soils are soggy. But the flaming temperament of Eucalyptus, manifested in dry, peeling bark, a multitude of slender branchlets, and numerous volatile chemicals, is perhaps the species' most deadly quality - bluegums were born to burn. These trees contributed substantially to the intensity and rampant spread of the Oakland hills firestorm in 1991. Even thinking of planting these trees in California's fire-prone climate is tantamount to arson. Bluegum eucalyptus produces a plethora of nasty chemicals, and while they're waiting to burn, they go about the business of killing almost any other plant that might try to grow nearby. While the idea of "chemical warfare" - also known as allelopathy - between plants is somewhat controversial and not well documented, eucalypts undoubtedly inhibit other plants from growing under their canopies. In addition to the chemical constituency and sheer bulk biomass of fallen leaves and bark fragments, bluegums change microclimates by shading habitats long exposed to a great deal more light. Typically, native plants don't compete well with eucalypts under reduced light conditions and a dense blanket of thick, leathery leaves. Moreover, the extensive (though shallow) root systems of these thirsty Tasmanian devils reduce available soil moisture, and large stands may actually dry up otherwise perennially active streams. In the process, even our relatively drought-adapted native species are hard-pressed to compete for the seasonally limited water resource. As if this extensive rap sheet weren't enough, these giants will pick on even the most diminutive of our feathered friends - the seductively lovely and sweet-scented flowers produce resin that appears to smother hummingbirds as they drink the tainted nectar. You may hear some "naturalists" rapturously extol the virtues of eucalypts as welcome stopovers for migrating monarch butterflies, but you might ask if they've put this fact together with that of declining populations of these elegant fliers. Other folks will claim that the lofty limbs of bluegums are prime raptor perches -- but you might ask, what native trees might once have prospered where these deadly behemoths now tower? And what will become of the raptor's prey once the grasses and shrubs that provide food and cover to mice and rabbits are displaced? If you can digest even a portion of this tale of murder and woe, and still look me in the eye and assert that bluegum trees still have a place in the California landscape, I'll suspect that you've had one too many cups of eucalyptus tea! For many land managers in California, the time has come to fight fire with fire, and to cut these woody bullies down to size. On the Caspar Headlands, community volunteers, working in cooperation with the Mendocino District of California State Parks - the property owner -- propose to initiate a eucalyptus removal program. Although efforts to thin the stands of eucalyptus and eventually replace these trees with native species will be the most apparent activity, the plan includes removal of other invasive non-native species, such as gorse, Scotch and French broom, and Himalayan blackberry. This work will restore habitats for native plants and animals, as well as improve the magnificent viewshed of the Pacific coast. The management of invasive non-native species and the restoration of habitats that support native species require considerable planning and a long-term commitment to the restoration site. While removal of the invasive species is generally the most apparent activity, a successful project should include planning, site maintenance, revegetation, monitoring, and continuing reevaluation of results and methods (adaptive management). A primary concern here is the ability of State Parks to maintain this commitment throughout a time of budgetary uncertainty and staffing shortfalls. Accordingly, the participation of the community will be essential in order to achieve project goals and objectives. Sustaining the commitment to the site is more important than adhering to well-defined schedules, but funding opportunities will probably require the accomplishment of basic goals and objectives. Continuing dialog and respect for the consensus process will be necessary so that all concerns are heard and addressed. One element of successful restoration will be the incorporation of an integrated strategy for the removal of the invasive non-native species. Such a strategy will include manual, mechanical, cultural, and chemical methods. Among these, the community and State Parks recognize that any proposal to use chemical methods will generate controversy. Continuing dialog and respect for the consensus process will be necessary so that all concerns are heard and addressed. However, I will take a moment here to address my concerns, and to provide more detail on the tentative proposal to use herbicides at the site. The proposed method of herbicide treatment for the site is direct application on cut stems; the material used will probably be either Roundup (active ingredient: glyphosate) or another similar product. Only those herbicides that are registered for this use through the federal Environmental Protection Agency and the California Department of Pesticide Regulation will be applied. Only trained personnel will handle and apply herbicides, supervised by a licensed pesticide applicator. Cut-stem applications involve the direct application of the herbicide onto the targeted plant, either by a brush, sponge, or wick applicator. Note this method of application avoids the release of herbicides into the air, and non-target plants and other organisms are avoided. Roundup applied directly to stumps does not leach from the targeted plants, and breaks down within the plants (Roundup's active half-life is 4 weeks). Roundup is biodegradable (products: water, carbon dioxide, nitrates, nitrites, and phosphates) and not absorbed by animal tissues. Nevertheless, caution and safety are essential facets of an herbicide treatment program, and minimal use and exposure to herbicides is a goal of this proposal. Herbicide use is recommended for this work for several reasons. In broad terms, the hazards and liabilities of eucalyptus and other invasive species have been well documented - what we stand to lose if we ignore the threats posed by non-native invasive species justifies the implementation of management strategies, chemically oriented or otherwise. Continued loss of habitat might well require much greater applications of herbicide in the future, so in this sense an ounce of Roundup applied now could save quarts of chemical application in the future. In addition, the chemical changes in soil precipitated by non-native species, such as nitrogen-fixation and pH alterations, may very well be more toxic or environmentally damaging than the chemicals used to control their growth and spread. For instance, land managers have observed that the nitrogen-fixing aspect of broom and gorse invasions pre-disposes infested sites to further invasion by non-native grasses and herbs. More specifically to eucalyptus, gorse, and broom removals, plants torn from the soil disturb the soil surface, facilitating the germination of buried seeds or resprouting from broken roots. The application of herbicides to stems cut close to the soil surface avoids such soil disturbance, and the herbicide moves systemically throughout the remaining stem and root tissues. Gorse and eucalyptus are very difficult to remove mechanically or manually, so the frugal use of herbicides on cut-stem surfaces also saves a great deal of time and physical energy. Stems cut and left untreated will quickly resprout; a site left untreated will very soon be re-infested, and prior efforts will have accomplished little. In summary, I recommend an integrated strategy for the removal of gorse and eucalyptus, one that includes some mechanical thinning and removals of stems, followed by minimal applications of herbicide to cut stems. Because of the capability of plants to compartmentalize toxic materials, re-application of herbicides will be necessary on some of the treated individual gorse and eucalyptus plants. They come from far away. They multiply and spread rapidly, overwhelming and disrupting native eco-systems. Lacking natural controls, they are soon rampant and defy attempts at eradication. Because they fail to "play nice" with the natives by providing natural food sources and habitat, the interconnectedness necessary for healthy environments is irrevocably harmed. An article in the Advocate News (3/27/03) on "invasive plants" pointed out that local nurseries are selling 16 species of "invasives" without any notice or warning at all. Should they be labeled like cigarettes? Meanwhile, let's educate ourselves and avoid the mistakes that were made when Caspar was becoming home to well-meaning pioneers. Newcomers plant fast growing non-natives for erosion control, wind breaks and hedgerows; for mosquito control, and for nostalgia. Many of Caspar's maladies result from "expert" advice, notably Sunset Magazine and its Western Garden Book. Our local Dorothy King Young Chapter of California Native Plant Society has a special department devoted to educating the public about "invasive plants." The Botanical Gardens presents "native plant workshops" and can be very helpful teaching about natives and "alter-natives." Not all invasives are as evil as gorse, Eucalyptus, starlings, and English Sparows. Some provide shelter, some produce food (although not as richly as our natives.) Some don't become problems - they just don't thrive here, or are easily eradicated. But why bother? There's not a place on the planet that is untouched by human folly and error. When I read about Australia's cane toads, feral cats, and rabbits, I almost feel superior. Then I look out the window and see huge patches of apple-mint, Himalayan berries, English Ivy, Periwinkle ...and I realize that "eradication" and "preservation" are as inseparable in Australia as they are here and everywhere. We can start by not planting more invasives while being careful not to create circumstances where exotics thrive -- gorse adores disturbed ground. But we also need to remove the ones that yield readily -- Himalaya berry, periwinkle, and almost all young exotics can be pulled up by the roots -- carefully, making sure you get the whole root. Share your knowledge with newcomers and oblivious neighbors ...gently, of course. And join us, please, in working out the best ways to deal with our well-established pests. The construction at the Community Center has stayed on schedule and is nearing completion. The building now rests on a firm new foundation, the bathrooms are functioning but await finishing touches, the beautiful back deck is almost complete, and by the you read this the ADA ramp and parking slabs will be poured. The last part of this project will be to remove and replace the front deck and stairs. Access will remain open through the rear of the building. Throughout this process, thanks to the adaptability of our contractor, John Wozniak, his crew, the renters, and everyone else, we have been managed to keep the Center open. Once this contracted work is finished, we can move on to the many, many important improvements and repairs that we have identified in the last year. To celebrate our improved Community Center I am planning an elegant dinner catered by Debra Dawson of Good Thyme Catering on Friday, June 6. Accompanying this dinner will be fine wines, live jazz, and a silent auction. The proceeds from this fund raising event will go towards further improvements of the Community Center -- see the accompanying list. Current classes at the center include Tai Chi, Salsa, Tango, Modern Dance for Children and African Dance. Events to look forward to are a Peace Dance Benefit on May 9 with Sock Monkey and Mambo This!, the fourth Friday Swing Dances, an art show benefit for the Senior Center on June 1, a concert with John Bush, Morgan Daniels, and Meridian Green on June 14 , the Caspar World Folk Festival on August 9 and 10, and Bioneers in October. For updates on classes and events check out the calendar online at CasparCommons.org or stop by the Community Center. On tax day, April 15, 1987, Susan and I moved to Caspar and into the home of our dreams. Two weeks later it caught fire. Okay, so the house didn't catch fire. But the gorse did. We had a large field of the stuff standing about eight feet tall. Our real estate agent had warned us that gorse was a pernicious weed, but since we had just found our dream house, all we said was, "but aren't the yellow flowers pretty!" Now those flowers were on fire, or soon would be. One of our neighbors had a field of gorse, too, and a wall of tangerine flames was advancing through his field toward ours. The air was filled with the cry of sirens and thick, black smoke. We had not yet met many neighbors, with the exception of a woman who had come by a few days before to welcome us to the neighborhood and to say that she had baked a batch of cookies the night before as a welcoming present. "But," she said with a rueful smile, "I'm afraid we ate them all." I liked her at once for this simple, ragged honesty. She was further proof to us that this was a wonderful little community ...except, of course, that it was currently on fire. Fire trucks were arriving from all directions: Fort Bragg, Albion, Mendocino, Westport. A Department of Forestry helicopter started circling, a huge canister hanging from a cable in its belly. "They're picking up water from the Caspar pond," explained a fire chief. "I hope they aren't sucking up the ducks," said Susan. The black smoke was obliterating the sky. Forestry trucks arrived with a crew of prison firefighters, and the helicopter, flying half-blind through the smoke, started making 500 -gallon water drops on the flames. One fire chief - we seemed to have dozens of them by now - said, "That will be the first one to go." He was pointing at the cookie-eaters' house. Ours, he added ominously, would be next. Soon, I was on the roof with a hose, wetting down the shingles of our new home. One of our neighbors climbed the ladder with me to help. "We're having a barbecue on our deck in an hour," he said incongruously. "You're welcome to come over." I said, "I'd love to, but I might be busy." Susan was down on the ground, meeting other neighbors who had seen the smoke and come to help. "What can we save?" they asked. And Susan, her personal priorities clear, set them to searching for the photographs (still in an unpacked box) and the cats. I climbed down from the roof, and we went back up the driveway, where prisoners were chain-sawing gorse to form a firebreak. Gorse was exploding like incendiary bombs not twenty feet from the property line. "Maybe," said the agent, starting to sweat, "...maybe we've come at a bad time." As it happened the property just to the east of us was for sale, and at that moment a car drove up with a real estate company's logo on the door. Out climbed a stunned sales agent and his client. The flames were progressing rapidly. Gorse was exploding like incendiary bombs not twenty feet from the property line. "Maybe," said the agent, starting to sweat, "...maybe we've come at a bad time." "Gee," said the client as they scrambled back into the car, "you said it was a hot property�"
Other neighbors arrived to offer help. But there wasn't much we could do. A giant and magnificent cypress tree at the corner of our property burst into a fireball and died. But the helicopter with its massive water-drops did its job. An hour later we owned a large field of twisted black sticks, but nothing was on fire. No one's house had been harmed. Aside from gorse and that one wonderful tree, our only loss was a family of rabbits who had lived in the gorse. We know now that gorse contains 35 percent oil, that it spreads quickly, laying down an underground carpet of twisted, clinging roots, and that its seeds lie dormant but viable underground for up to thirty years. That day gorse-eradication became an ongoing obsession for us. We grub it out, we cut it down, we wait for it to return. Susan and I actually did go to the neighbor's barbecue that night, where we ate grilled oysters and drank Anderson Valley wine, and met still more neighbors. It had been a day of gorse and a day of neighbors - and we want you guys to know that we are still grateful for the help. I called Caroline Schooley to ask her if she'd be willing to be interviewed about her continuing, and largely successful battle with gorse. "Yes," she said, "But Stuart Tregoning should be in on that. He did the work, and the method we used is the one that really works." A week later Caroline, Stuart, and I met in her livingroom on a rain-threatened December afternoon. John and Caroline Schooley bought their house on Caspar Point Road as a vacation home in 1974. "The place was a bargain," she explained, partly because the back acre and a half of the property was covered in six-to-eight-foot tall gorse plants. "We heard that Stuart was the person who knew how to deal with gorse, so we contacted him� and he brought over this monster John Deere tractor. You could hear it coming when it was still east of Highway One." Stuart and, Ralph Eagle, a neighbor of the Schooleys, had been working on gorse-eradication methods. They put their heads together with the Schooley's and developed a system they believe to be a successful way to greatly suppress, indeed, to virtually eradicate gorse. Using a small but powerful mower on a three-point hitch, Stuart first mowed down the high gorse, backing over it, cutting it down to stumps. Then he used a disk plow which cut 12" deep, following up with a spring tooth which raked the roots up to the surface, "Like a cat going through kitty litter," remembered Caroline. The Schooley family then piled and burned the roots. After that they followed up with biannual plowing. Today Stuart uses a Howard Rotovator which works like a giant garden tiller. The young gorse plants have really shallow roots, so cutting them off two inches below the soil level kills 99% of them. Recently, though, the Schooley's haven't had to plow at all. Neighbors started grazing horses on the Schooley land, and the horses, it turned out, liked the young gorse shoots. "They taste like endive," commented Caroline, wryly. "It's worth trying� once." Today the Schooley property is almost entirely gorse-free. Stuart and Caroline both scoff at argument that plowing also takes out native plants. "The goal was to encourage the natives to take over instead of the gorse," says Caroline. "Remember that the heavy infestation was on former farm." Stuart points out that most natives are perennials and seed late, while introduced plants are annuals and seed early. So native plants can be encouraged just by adding an extra step. "When the introduced species has just started to set its seeds, you mow once, stopping the seed production. Then you wait for the natives to drop their seed, and till the area for gorse, giving the natives a chance. That's what I do at my place." Caroline pointed to a six-foot hedge of gorse that lines the road on a nearby property. That hedge has been sprayed repeatedly with herbicides," she said. "The argument against herbicides is that they just don't work, no matter what you think of them. 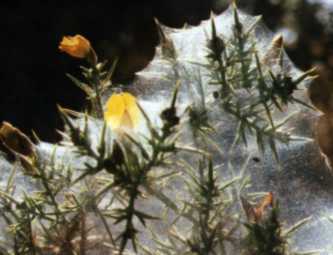 Spraying causes the tops of gorse to die, but the jury is out on whether you can get the roots. All you do is temporarily produce a severe fire hazard, and you don't kill the plant." I asked what if they knew about the "cut and paint" method that was recently used in Bodega Bay wherein large gorse plants are cut off with chainsaws at ground level, and the stumps immediately painted with herbicide. "We tried it," sighed Caroline. Shaking his head, Stuart corrected her. "We invented it." Actually he worked with some county farm advisors to develop the method. And Caroline admits that in their experiments they may not have applied the herbicide soon enough after cutting. But in any event, the gorse has came back. What really works, it seems, is cutting, plowing, and perseverance. Gorse eradication remains high on the list of priorities for the Caspar Community. The Tregoning-Schooley system is one of the more promising tools we've found so far.